Benjamin Pollak has been traveling the European poker circuit for a decade, but 2017 was truly the breakout year for the 34-year-old Frenchman who finished third in the WSOP Main Event for a mammoth $3.5 million payday. Pollak: "I wanted to prove myself that I can beat the best." He took off from there, trying to elevate his game and make a name for himself in the high buy-in fields. Pollak notched four six-figure cashes between his hit at the Series and the US Poker Open. He's now added two more, including an impressive $416,500 first-place prize for winning Event #6: $25,000 No Limit Hold'em. He needed under four hours to accumulate all of the chips on the star-studded final table, earning the top-cash after just 87 hands. "I wanted to prove myself that I can beat the best," Pollak said, and he certainly did. He claimed the largest single prize that has been awarded at the US Poker Open so far, beating a 49-entry field. Pollak made a last-minute decision to fly in for the series, and he accepted Daniel Negreanu's $50,000 prop bet on a must-win leaderboard race. He's now second in the standings. It might still be a long shot at earning some extra money from Negreanu, but Pollak can be more than satisfied with his performance. He's already amassed $554,600 during this week in Las Vegas, the city that has treated him well in the past eight months. Pollak's victory came in a surprisingly quick fashion. The six-handed final table started with all players guarding deep stacks. Pollak had a great start right off the bat, rising to the chip lead in the first few hands. Elijah Berg was the first casualty. He raised with ace-king and tangled with Jason Koon who flatted with pocket sixes in position. Berg triple-barreled on a low board that saw him river a wheel but Koon himself made a seven-high straight and happily called down to send Berg to the rail. Berg, who works as an ER doctor, said he enjoyed the fierce competition, calling the tournament "a really challenging event." Aside from Koon, it was Brian Green who benefited the most from Berg's early exit. Green fell to a short stack and laddered up the first pay jump before squeeze-shoving with ace-deuce of hearts. Chidwick originally flatted king-eight of diamonds on the button and then closed out the action. He had good odds to call and put Green at risk. Green: "This is the week of Chidwick." "This is the week of Chidwick," Green knew that he was up against the hottest-running player in the building. The board confirmed his statement as Chidwick hit two kings to dispatch Green in fifth. The quota of two eliminations before the first break was filled once again, and the remaining four players continued with big stacks. Isaac Haxton was the next one to leave the table after playing an interesting pot against Koon. Haxton went for a three-bet out of the big blind with ace-four, and Koon stuck around with ace-queen. Haxton then barreled a wheel draw on the flop before they both checked the turn. An ace on the river troubled Haxton, who ended up check-calling for all of his chips. There's no doubt about Haxton being one of the smartest brains that have ever tried to solve the game of poker, and he offered his thoughts on the crucial hand that saw him depart in fourth place. "I thought about shoving for value," Haxton explained what was going through his mind on the river. Then he noted that his kicker didn't play and that made him incline to check. "I thought this is a good hand to check-call with and pick off some bluffs," he said, noting that he didn't block some of the hands he thought Koon might think to bluff with. Chidwick added $183,750 to his score card for the week. Koon was the driving force on the final table. He was responsible for tackling Chidwick in third place, wounding him with two pair against the top pair and top kicker in a blind-versus-blind spot. Chidwick was left with fewer than three big blinds after the hand, but that was something he's been brilliant to deal with throughout the festival. Chidwick: "I've definitely lost any rights to complain for a while." "I wanted to make this more of a challenge," he joked. This time, however, he wasn't able to climb back from the dust. 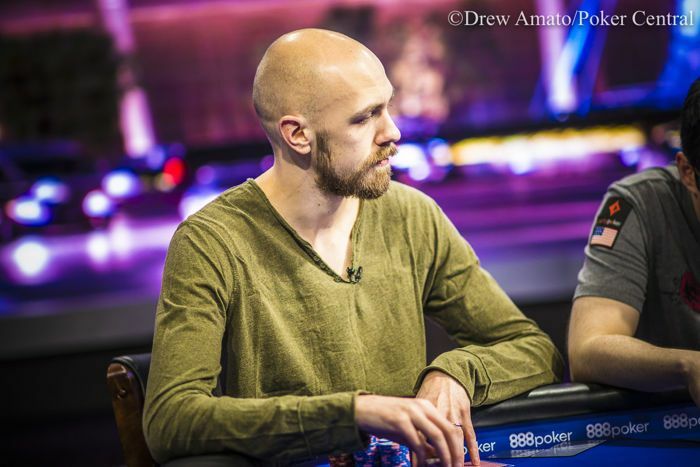 Koon took the rest of his chips and Chidwick settled for a $183,750 payday. "I've definitely lost any rights to complain for a while," Chidwick said after missing out on a hat-trick. 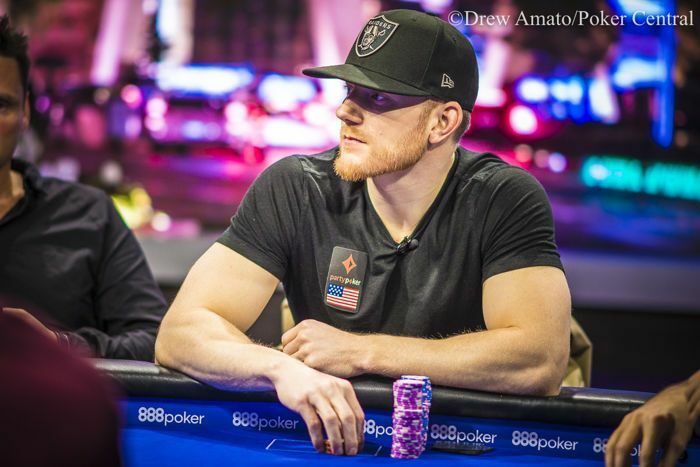 Koon had a two-to-one lead coming into the heads-up match with Pollak, and he kept it through the first part of the battle. The critical moment of the duel came on the 73rd hand of the day. On a five-three-deuce flop, Koon had top pair and an open-ended straight draw while Pollak hit top two pair. It was inevitable to see the chips go to the middle. While Pollak was ahead, the race was still close to a coin flip. The jack of hearts on the turn brought an even bigger sweat as Koon had a total of 21 outs to finish Pollak off, almost a half of the cards in the deck. He added a flush draw to his straight draw and could now also win, should the jack hit the river to counterfeit Pollak's two pair. For all the cards that would crown Koon the champion, the eight of spades wasn't one of them. 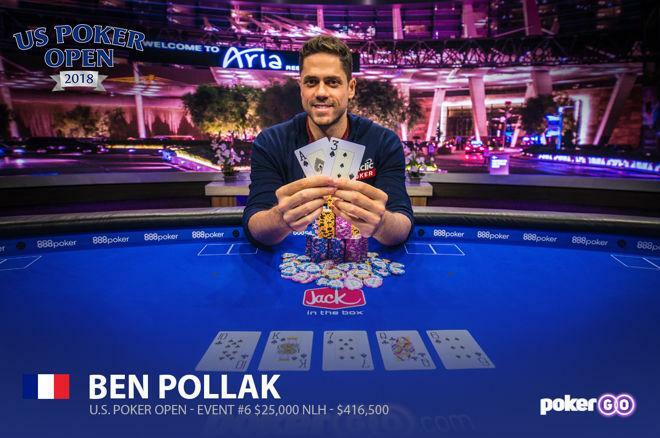 Pollak took over the chip lead, and while Koon survived his elimination with a tremendous fold of trip aces against Pollak's rivered queens-full, he wasn't meant to claim the chips back. His swan song came when he shoved with king-five, and Pollak called with ace-three. As was typical for the heads-up, the flop and turn once again brought many possible scenarios for both of the players. Koon hit top pair while Pollak had a flush draw, then Koon added his own flush draw and Pollak added a gutshot in the meantime. The river gave Pollak the nut-flush to finally unravel the drama, allowing him to scoop the first-place prize.